Broilers are an overlooked and underused kitchen preparation tool. Broiling is a healthy cooking method requiring no added fat. In fact, fat drains off the meatballs when you cook them in a broiler pan. Broiling exposes food to very high heat at close distance for a short cooking time. Combine this healthy cooking method with high quality meats and you've got a recipe for delicious and healthy meatballs. Make the meatballs uniform in size so they cook evenly. Use a small cookie scoop, melon baller or measuring spoon for consistency when forming the meatballs. 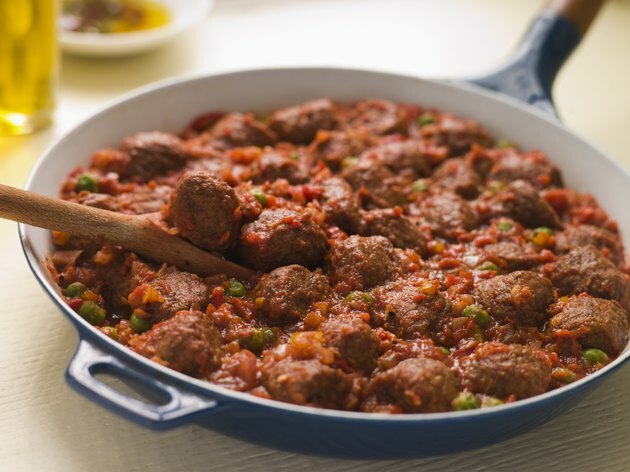 Place each meatball onto a broiler pan or in a cast iron skillet. Broiler pans allow air to circulate underneath the food for even cooking. Cast iron skillets work well because the heavy iron distributes heat evenly and tolerates high temperatures well. Baking sheets work in a pinch if you have nothing else. Leave about 1/4 inch between the meatballs for even browning. Place the pan underneath the preheated broiler. Most broilers have off and on capabilities with no other temperature settings. If you have choice between "High" and "Low," put the broiler on the high setting. Your oven rack should be in the highest position so the meatballs are within inches of the heat source, unless otherwise directed by your oven manual. Broil for about 10 minutes for meatballs 1 inch in diameter, flipping them over in the middle of the cooking time, or until the meatballs reach an internal temperature of 160 degrees Fahrenheit on a meat thermometer. Approximate cooking time depends on the size of the meatballs. Remove the meatballs from the broiler. Prepare your meatball recipe as directed, making each meatball uniform in size and shape. Prepare tomato sauce and let it simmer in a saucepan on the stove top. Broil the meatballs for approximately 10 minutes, turning them halfway through. The meatballs should be nicely browned but only partially cooked inside. Remove the meatballs from the broiler and place them into the sauce with tongs. Simmer the sauce and meatballs until the meatballs are cooked through. Depending on the size of the meatballs and how thoroughly they pre-cooked under the broiler, it could take 20 minutes or longer to finish. Use a meat thermometer to make sure the meatballs reach 160 F in the center. Ground meats such as beef, chicken, pork and veal carry an increased likelihood of contamination because the grinding process mixes the meat together. Cooking to the proper temperature is important to prevent food poisoning. Serve the meatballs with spaghetti and tomato sauce.